Sign in with Google now for your own free punchclock. This site is a public copy of some of the applications I've written for personal use at holtstrom.com. If you see other applications there that you'd like me to make available here, let me know. If you had an existing punchclock and want to port over the data, Sign in with Google then click here. Note: I mostly use Chrome. So if you see problems, or the site looks bad in other browsers, please tell me. You can always send feedback through the little gear icon at the top-right of the page. This site is free for anyone to use. All you have to do is Sign in with Google. 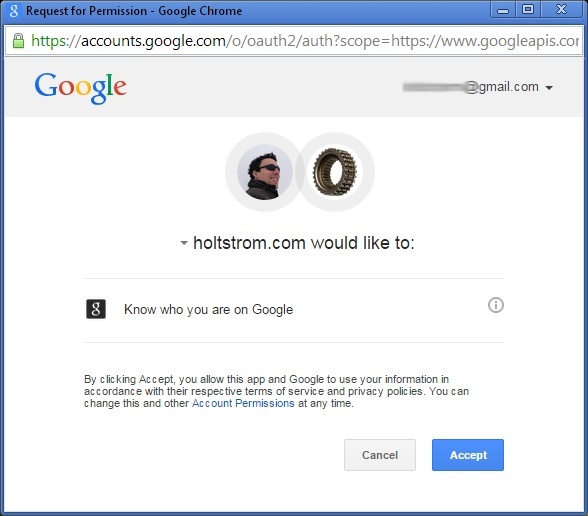 Google just tells me your Google+ ID which is how I keep the data you provide private. When you sign in, you'll see a screen like the one below. When you "Accept", google tells me your name and Google+ ID, as shown below. I'm given only the information you've made publicly available on your Google+ page. If you have any questions, you can ask me. Be sure to include an email address so I know where to send the reply. By signing into this website, you agree and acknowledge to be bound by these Terms of Service. These Terms of Service may change at any time. They were last updated January 9th, 2016. This website reserves the right at any time and from time to time to modify or discontinue, temporarily or permanently, the website (or any part thereof) with or without notice. You agree that this website shall not be liable to you or to any third party for any modification, suspension or discontinuance of the website. This website is provided "as is" and without any warranty or condition, express or implied or statutory. This website specifically disclaims any implied warranties of merchantability, fitness for a particular purpose, non-infringement, information accuracy, integration, interoperability or quiet enjoyment. You understand and agree that you use the website at your own discretion and risk and that you will be solely responsible for any damages that arise from such use. Under no circumstances shall this website be liable for any direct, indirect, special, incidental, consequential or punitive damages of any kind. Your only right with respect to any dissatisfaction with this website shall be to terminate use of this website. This website at its sole discretion, may terminate your membership and/or remove and discard any information associated with the membership without notice if this website believes that you have violated or acted inconsistently with the Terms of Service. This website will not be liable to you for termination of your membership and/or removal or discarding of any information associated with the membership. This is a non-profit project maintained by a single individual. The website runs on a hardened AWS instance and reasonable effort is made to resist attack; however, a well funded, determined individual could gain control of the server and all its content. The content you enter on this site is yours. I won't look at it or share it with anyone. Ever.